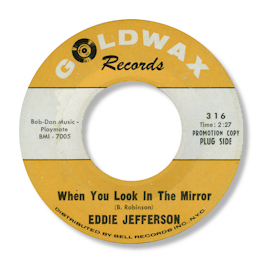 The mysterious Eddie Jefferson’ only had 2 singles issued – despite signing for a 6 side deal with Goldwax. 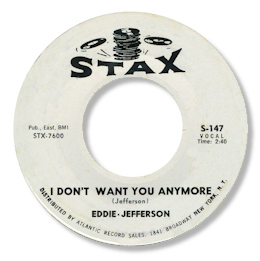 His first 45 for Stax, I Don’t Want You Anymore is a classic deep soul ballad featuring Eddie’s tasteful high tenor and some fine harmonies from the male chorus. And of course the incomparable house band. When You Look In The Mirror is rightly regarded as a deep soul classic, one of those 45s you could use as a perfect example of the genre. More wonderful Memphis magic. Joe Haywood first recorded the song for Enjoy a couple of years previously, also with great artistic success. The flip is the fine midpaced “Some Other Time”. Note ~ You can find "I don't want you anymore" on the appropriate volume of the first set of Complete Stax Singles Box sets, and both sides of the Goldwax 45 are on the appropriate volume of the Kent UK "The Goldwax Story" CDs.